Why Do I Love Movie Scores?! Here in Idaho Falls, there is a small number of true cinefiles. Those of us who truly love to see movies in a different, and much broader, scope than others. Here at the Group Real Estate, it is always fun to see the reactions when I see a movie, or I am talking about a movie. Most people here hate talking movies with me. Or they just get frustrated that I am going “too deep” with the movie, instead of just having fun. For more info here, go check out my blog on why I became a cinema snob. It’s who I am, it’s what I love, and it’s what sets me a part here. Including having a conversation about a movie that one of my colleges say the other day, who came to me and said, “You know, before meeting you I would have enjoyed this movie …probably.” The influence is real, people. Become a cinefile! If not, that’s okay, too. What I really want to highlight today is the scores. The musical pieces that truly bring a movie together. 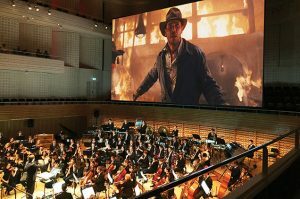 John Williams directing the London Symphony on the Raiders of the Lost Ark soundtrack (fun fact, is the orchestral pits will play the music scene for scene as it’s going and the composer will watch the changes, as this helps him know when to fade, do interludes, etc. This isn’t done as much in today’s movie making, sadly). The influence that music can have in our lives is a big deal. How many times have you been out on a drive, or at home in a deep mood, or at a wedding, a party, a family function, the list goes on. These types of environments can be helped out immensely with great music. The same can be said with film, and the right type of score. This comes with the territory of having the right composer doing the music as well. We all know the big ones. John Williams. You may not know the name right off, but you know his work. Star Wars. Indiana Jones. Jaws. Harry Potter. Just to name a few. There are a few others that will really resonate with you, that you may not know right away, but you know the films, and you remember the scenes that impacted you. The reason for the impact, is directly related to you getting “the feels” from the score. Inception, the song Time, by Hans Zimmer was truly effective in the way it manipulated your heart rate as you were watching the intensity of the last hour of that movie. Hans Zimmer, himself, has studied out different “tick” techniques to do this on purpose. Next time you watch Interstellar, pay close attention to how he utilizes a ticking and a crescendo of the music going up and down to help with the intensity. When you see Dunkirk, he is especially great with this. There is a ticking that is going the entire film until a very pivotal moment that halts it. It’s spectacular to listen to. In a new age of doing scores for movies, TV shows, video games, trailers, etc. the idea of being able to put an entire score together on a computer is amazing. This is something that is done very often now. Junkie XL’s very powerful score for Mad Max Fury Road was all done on the computer. No orchestra. Now, don’t get me wrong, I love hearing the orchestral pieces done, and the skill that that takes as a composer of music, after piecing together music for scene to scene use. But hearing this score (listen below), is something to behold when you know that it was one guy, with a small sound team, piecing the entire score together. One of the best soundtracks of all time is The Last of the Mohicans. Back when that film was made, there wasn’t a huge focus on score, musical pieces being a thing, unless it was Danny Elfman or John Williams. Danny Elfman is a master. The work he does on Tim Burton movies, the weird orchestral pieces he can put together, the music he did for Nightmare Before Christmas, an accomplished singer as well, as he is Jack Skellington’s singing voice. He has also done the Spider-Man movies, that Sam Raimi directed. He is a master that can do all styles. However, I point back to The Last of the Mohicans. The music that Randy Edleman gave us was a character all in it’s own. The score became a characters in so many parts of the film! This was mind blowing to me when I was younger and is a part of musical scores that I still listen to, to this day. When a film is able to make the music another character in the film, it has done it’s job. This is more and more now, especially with the way that scores are done in today’s world. Next time you watch a film, make sure to let the score sweep you away. Let the emotion in music help your experience in watching the film. As you start to really let the music in film sweep over you, you will start to feel the cinefile in you waking up!